After surgery at the Southeastern Spine Institute, your doctor may recommend a back brace to facilitate your natural healing process. The brace can support your back, your neck or for both, depending on how much support you need. While some patients may find braces uncomfortable, others report enjoying the feeling, especially when driving. The primary function of the Soft Lumbar Corset is to provide muscle support to your lower back. While this back brace is often used to alleviate the symptoms of arthritis or lumbar instability, it also can reduce back pain through muscular support. The corset serves as a constant reminder to minimize your back motion while you heal. It also encourages proper body posture. This brace is used routinely after lumbar spinal surgeries to provide the support necessary for the muscles to recover. Its purpose is not complete immobilization, so you’re advised to use it only when it’s helpful. For the first six weeks, your doctor may recommend that you wear it if you’ll be out of bed for longer than 15 minutes. After this period, you’re encouraged to wean yourself off the brace gradually, with the guidance of your physical therapist and doctor, as you return to your normal activities. The Thoracic-Lumbar-Sacral Orthosis (TSLO) is a stiff brace employing a clamshell design. It uses a low-weight, high-strength plastic in a two-piece configuration. Though stiff, it also has padding to be as comfortable as possible. This brace is necessary typically after a spinal fracture to prevent additional damage through excessive movement. Following a spinal fusion surgery, the TSLO back brace can provide additional mechanical spine stabilization, and may need to be worn for several months. While you need not sleep with the brace on, it’s recommended that you wear it if you’re up for more than 10 minutes at a time. This is the same sort of back brace used to correct scoliosis of the spine in young people. The Lumbosacral Orthosis (LSO) can either be a hard or soft back brace, depending on the type of surgery you’ve received. 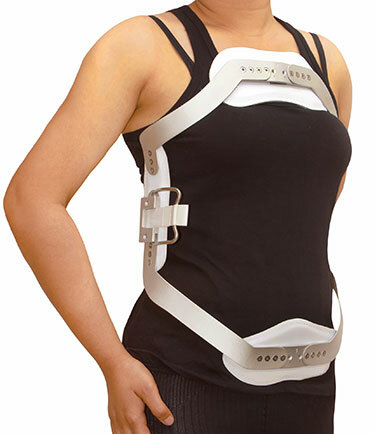 This back brace focuses its support on the lower, or lumbar, portion of your back. Cervical collars are considered a neck brace. Y9u may need one after a neck or spine injury or following surgery. They also come in both hard and soft versions, though the soft version is far more comfortable. Hard ones generally are used for more serious cases. A scientific study comparing them didn’t show any measurable improvement in motion restriction for the harder type. Thus, unless your needs require the hard one, always choose the softer version. Your doctor will discuss the options with you and recommend the best back braces based on your specific situation. Although they may inhibit some of your normal activities and seem like a burden, back braces can be a vital part of the comprehensive post-op treatment you’ll receive at the Southeastern Spine Institute.